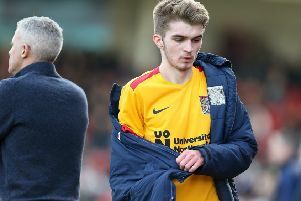 The 18-year-old made his first appearance for the Cobblers as a first-half substitute at Cambridge United in January but he was made to wait another three months until his full debut, which came against the high-flying Stags on Saturday. Pollock’s rise to prominence has been unique. A star of YouTube club Hashtag United, who have half a million subscribers, he’s no stranger to the spotlight and that showed during his assured and impressive debut for the Cobblers, his hometown club. “It’s a dream come true,” said Pollock. “I knew it would be a tough game against second in the league but the boys did really well and I’m just happy to get a good result out of the game. “I didn’t think it was too bad for a full debut. In games like that you’ve just got to land on second balls and be up for the game and I thought I was up for it and that showed. It’s amazing to give back to the fans because I was in their situation wanting the same and singing in the crowd for my team so I know how much it means to them and happily it all paid off. 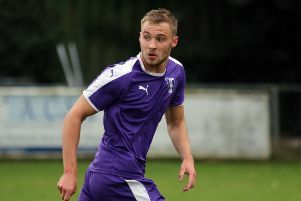 The midfielder, who signed a two-year scholarship with Northampton back in September, turned heads with a series of goalscoring performances for the youth team in the autumn, leading to a loan spell with St Neots Town at the start of 2019. That helped him prepare for senior football ahead of his full debut on Saturday, when he partnered Foley in midfield and caught the eye with his hard-working, high-quality display. Pollock was substituted for John-Joe O’Toole in stoppage-time and manager Keith Curle confirmed afterwards that was to allow supporters to show their appreciation of his man of the match performance with a standing ovation. “I think at the time we were defending a free-kick so the game paused and I heard them announce it (man of the match),” Pollock added. “It’s just an amazing feeling to make my full debut at home in my hometown and to get the reception that I did was just as amazing. Pollock was made aware of his inclusion in the team the day before, adding: “I was told on Friday when the manager picks the team and there were a few nerves before but once you get into the game you settle down and I was OK. Being from the town and a former season-ticket holder at Sixfields, Pollock had plenty of friends and family in attendance to watch him realise a childhood dream on Saturday. “I had 12 friends and family up in the crowd and I saw them when the full-time whistle went and gave them a little wave,” he continued.